The Carioca Bass EP, out now on Little Owl Recordings, is a collaboration between Brazillian MC Zuzuka Poderosa and Bay Area beatmaker Kush Arora. They’re mining the still-fertile world of baile funk, tweaking the formula made popular by bigtime musical globetrotters like Diplo until it rubs up against an ever-expanding global bass music scene that’s still figuring itself out (and never standing still). The EP is set up like an old-fashioned dance 12-inch, with two mean tracks (“Pisicodelia,” an almost industrial Lady D-like smack upside the head, and “Seda”) and a whole bunch of wide-eyed remixes (including contributions from Chrissy Murderbot and CEE). “Seda” is a pro-pot, anti-criminalization party track that’s all peaks and no valleys, one storm of grinding energy after another, with a gloriously extended beginning of choppy muffled grunts. 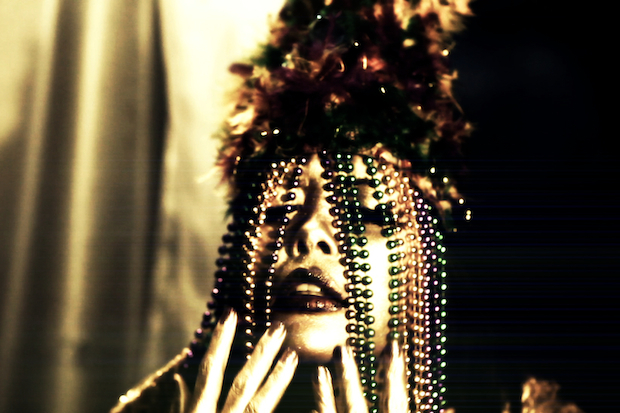 Its video, by Artur Kummer (director of photography for the Brazilian music documentary Beyond Ipanema which featured Zuzuka), moves from a South Bronx mansion to an expressionistic Kuchar Brothers medium-budget netherworld, featuring Zuzuka as a futuristic #AllGoldEverything shaman at the center of it all. Dawn Richard, watch out. You can watch the video for “Seda” by Zuzuka Poderosa & Kush Aurora here, exclusively at SPIN.